The Exceed Robotics’ STEM‐focused curriculum aims to teach students step‐by‐step the core of robotics and engineering. Whether new to robotics or have experienced in robot competitions, our program will expand student’s knowledge in programming, robot building, engineering, computer design and 3D printing. We teach students the tools that are shaping our future in a fun and engaging classroom environment. 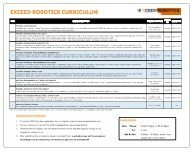 Developed and refined by a team of robotics engineers and certified teachers, the Exceed Robotics curriculum follows an academic approach in teaching robotics rather than conventional “build and play” programs. Class project themes are based on rapidly growing areas such as autonomous vehicles, bionics, smart factories, medical robotics, and space and ocean rovers. Courses are designed to also develop non‐technical areas such as presentation skills, teamwork, perseverance and creativity. Click on a course below to view a brief description. The first term of Arduino C Coding. The term begins with simple projects on how to use Arduino Microcontroller to flash LEDs, fade LEDs, use Photo Sensor to detect light, and program Push Buttons to control the devices. It also covers basic DC Motor conrol and making a rover to move around the field. Students will begin to develop skills on how to use an actual Microcontroller using C language. Brief Electrical circuits are also covered within the term. The term teaches skills on how to prorgam distance sensor with Arduino, also coding techniques to make use of loops. Students will program a distance sensor to read the actual distances from objects around and display the values onto the computer. The peoject is then to add the distance sensor to the rover and make the rover move by use of the distance sensor. Students learn how to ping the sensor and read ultrasonic reflections. They will then practice using math to convert the time into distance by knowing speed of sound. This term is all about Servo Motors. Servos are used in a variety of Robots where specific movement is needed. Some examples are Robotics Arms and Levers. Servo motors can be considered “Smart Motors” since exact motor movement can be programmed. The programming involves concept of degrees which will be taught within the term. Students learn how to program an armbot to pick up an object from a location and places it in the designated spot. The final term of Arduino is all about making “Smart Home” using various sensors and functions. Temperature sensor, Humidity sensor, light sensor and finger touch will be programmed to monitor varioous activities within the house. Students work with multiple sensors to alarm when specific temperatures or humidities are reached within the house. At this term, students are encouraged to use their Arduino at home. They are given list of ongoing projects which they can develop on their own at their free time. Parents are welcome to provide an Arduino kit for the kids to work on at home.